How many beds do you need? Each camper detail page provides the size of the beds in the camper and how many it sleeps. You’ll also notice a floor plan so that you know how many beds there are and where they’re located. Can your vehicle tow the camper? Most SUVs can easily tow our pop up, hybrid and small travel trailers. Please click here for more information on towing, including a resource where you can look up your vehicle and see how much it can tow. How much electricity will you need? If you’re camping in an area with electrical hookups 30 amps is sufficient. However if you’re heading out to more remote areas and expect to need electricity for things like a microwave or for the outlets to work, you’ll want a generator. We have generators you can rent and take with you. If you want to power the air conditioner, you will need two generators because of the high power consumption. If your electrical needs are a little less demanding, we also have solar systems you can rent. Contact us with questions and to discuss the best option for your trip. 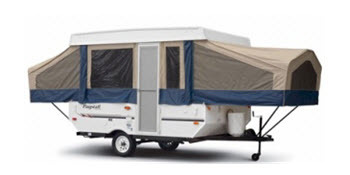 Pop up camper rentals are lightweight, have canvas walls and are a perfect choice for small groups or midsize SUVs. Pop ups have standard amenities like a refrigerator, furnace, water, and a kitchen area. We have six models of pop up camper rentals to choose from. Browse our pop up camper rental fleet! Hybrid Camper rentals are hard sided units with walk-in bathrooms and showers as well as standard amenities like A/C, heat, water and a kitchen area. The front and rear feature pop out beds with canvas above to give you more room without the added weight of a large travel trailer. Small hybrid campers weigh around 3,000 pounds, so they are easily hauled by most SUVs. Large hybrid camper rentals can sleep up to eight and have all the amenities of home. Browse our hybrid camper rental fleet! These are a great option if you want a fully hard-sided camper, but don’t want to tow one of the larger and heavier travel trailer options. 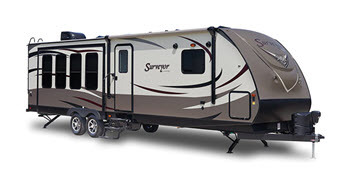 Our small travel trailer rentals weigh less than 3,000 pounds, so they are easily hauled by most SUVs. Get more insulation and amenities like bathrooms, air conditioning, heat, water, a freezer fridge and a kitchen area. 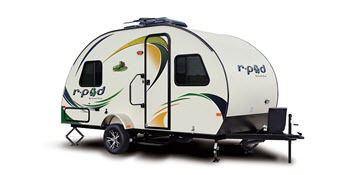 Browse our small travel trailer rental fleet! Our large travel trailer rentals are hard sided units that are longer and heavier than our small travel trailer options. For these models you’ll need a capable towing vehicle and a brake controller. But large travel trailers comfortably sleep more people and have more space, so it’s a great option if your travelling in a large group. Like the rest of our trailers, you’ll get all the comforts of home: air conditioning, heat, walk in bathroom, kitchen, a slide out, and an ample “living room” area. 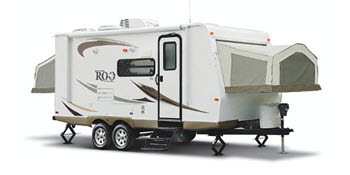 Browse our large travel trailer rental fleet! Camp in style! Luxury travel trailers have the ultimate amenities and feature large slide out sections, creating a very spacious feel inside. Premium materials make it feel like a palace on wheels. Get all of the amenities in the camper options above, and be the envy of the campground. 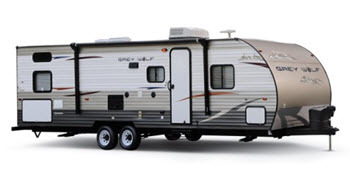 Browse our luxury travel trailer rental fleet!